What is honeysuckle flower? What is it used for? There are approximately 200 species of honeysuckle that grow worldwide, all of which belong to the genus Lonicera, of the family Caprifoliaceae. Although they are usually found in the temperate zones, honeysuckle has also been known to grow in the Himalayas and southern Asia. 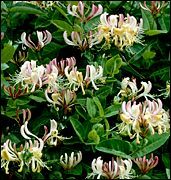 The Japanese honeysuckle (Lonicera japonica) is used in traditional Chinese medicine, and will be discussed in this article. It has fragrant, yellow-white flowers and black berries. Different parts of the honeysuckle are used to treat different conditions. This article discusses the properties of honeysuckle flower; honeysuckle stem is discussed in a related article. The flower buds are gathered in the beginning of summer, then dried in the shade before being used in herbal remedies. They can be used raw, or after being fried or distilled. How much honeysuckle flower should I take? What forms of honeysuckle flower are available? What can happen if I take too much honeysuckle flower? Are there any interactions I should be aware of? What precautions should I take? Editorial Committee of Chinese Materia Medica. State Drug Administration of China. Chinese Materia Medica. Shanghai: Science and Techonology Press, 1998. Fan JQ, et al. Guangzhou Journal of Medicine 1998;29(3):59-62. Wang SP, et al. Journal of Popular Medicine of Chinese Ethnic Minorities 1998;(5):40-41. Yang L. Zhejiang Journal of Traditional Chinese Medicine 1998;33(6):282.